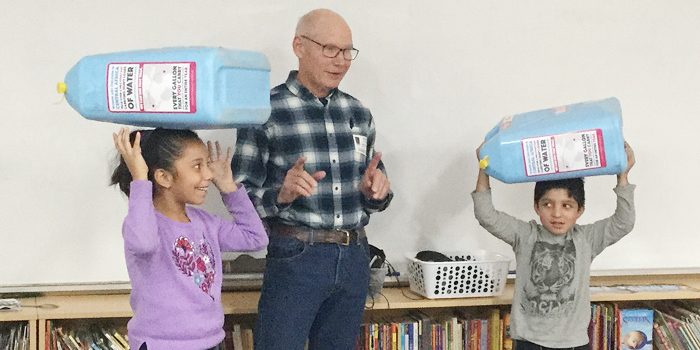 LEESBURG — Second-grade students in Leesburg Elementary School’s English language learners program have been exploring the need for and delivery of clean water. As students read about countries that do not have access to clean water, they gained a greater appreciation for the water that comes out of their faucet every day. He also shared how Water For Good digs and maintains wells in the Central African Republic so that one day, every person in the Central African Republic will have access to clean, lasting water. The second graders loved practicing carrying the jugs on their heads and realized just how difficult the skill is. The teachers and students said they appreciate Hocking for giving his time and thanked him for the valuable lessons they learned.